BEAUTIFUL immaculately presented compact, one bedroom upper flat in very well kept development, close to the High street and the infamous beach. The property is accessed through its own private front door and up a private carpeted stairway. There is a good size lounge overlooking the communal gardens, which is well furnished and has a lovely ambiance. It has recently been freshly painted. There is a small, but very useful utility room off, with washing machine and storage. The kitchen is laid out well and maximizes the space, with integrated appliances and colourful splash black. Furthermore, the bedroom, in neutral tones has a cosy feel, and its well furnished. The family bathroom has a three piece bathroom suite, with shower over bath and electric wall mounted radiator. 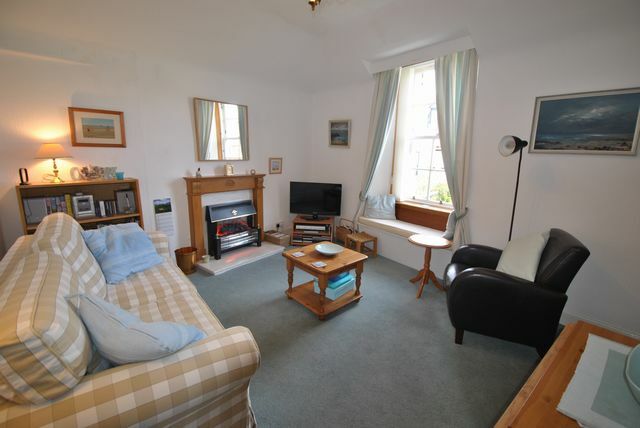 The property is heated by electric heating and is double glazed. North Berwick is a beautiful small town, with a brilliant High Street, and is easily commutable to Edinburgh. Suitable for a single person. Landlord Reg: 41120/210/22401.EPC F.